TBS offers reward points service in order to show appreciation for all of your support and help you enjoy direct discount or benefit when you place an order at our website. 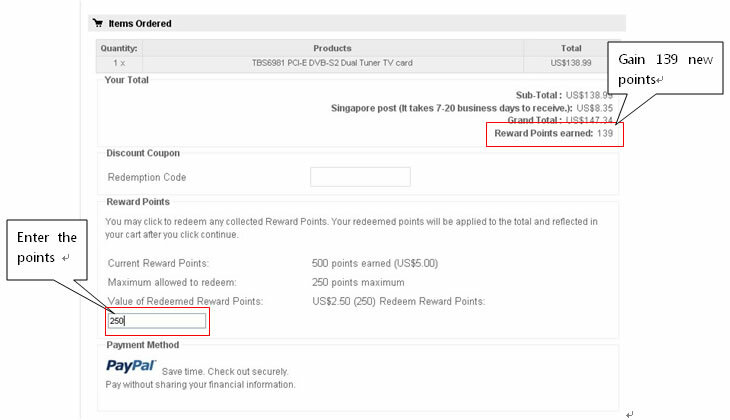 Reward Points is a kind of special discount for who registered or placed an order on TBS. Once you register or place an order, you will get according points. These points will be added automatically to your account for your further orders. You can sign into your account to view the status of your points at any time. As long as you have points in your account, you can use those points to pay for purchases made at TBS. During the checkout process, you can select a payment method including deducting your points balance to pay for your order. After you have paid by your points, the number of your points will be deducted accordingly from your account. For example, if your account has 500 points, you can enjoy US$5 deducting when you place an order. As thanks for old customers, every customer who has placed an order will get a certain points according to the product value. For example, if you buy a TBS6981 PCI-E DVB-S2 Dual Tuner TV cardï¼ˆU5$138.99, you can get 140 points(equivalent to US$1.4) as a reward. Our system will automatically accumulate the points. You can use them at any time and any order. Most of new comers are confused how to use these reward point. Actually, it is very easy. Here is a tutorial to show you use the points when you purchase. Confirm to place your order and get to payment process. You will see a title bar of Reward points in the middle of the page. Enter the points and get deduction for your order. Note: please note there would be a maximum redeemed points(â‰¤250 points) at the first order.